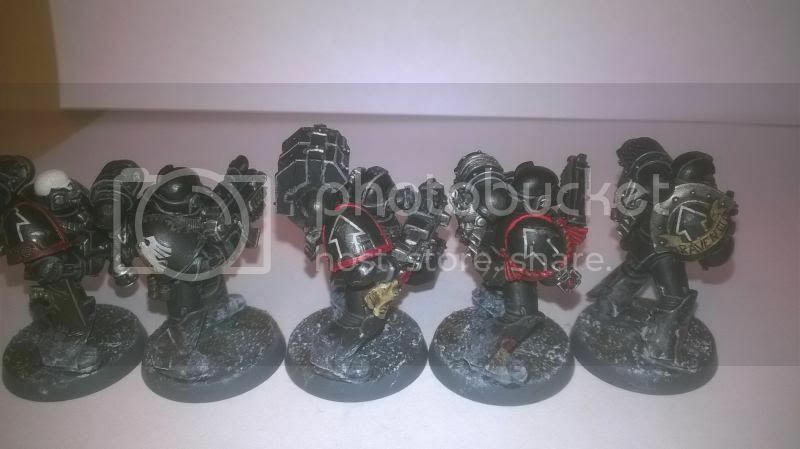 Hey, so I finally managed to get a new army started and I'm going for Raven Guard. This is eventually going to turn into a Project Log but I didn't want to start that until I had a bit more done. However, I got this first one just about finished. He still needs some small details done, Chapter badges and insignia and of course proper basing but I wanted to get some feedback on the general look. It's my first time trying various things, black power armour, battle damage and weathering. Oh and apologies in advance for crappy phone pictures. Edited by Asamodai, 28 March 2014 - 06:46 PM. Looks like a good start. Also, if you want to go for fluff accuracy, the shoulder trim is based on speciality. 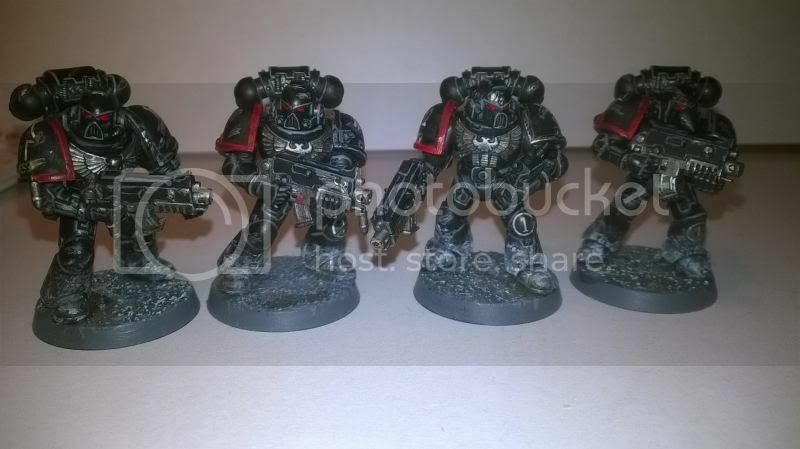 Tacticals have green, assault have red, devastators are yellow and veterans are black trim with white shoulder pads. Either way i'm looking forward to seeing how this goes. I think that got kinda retconned. 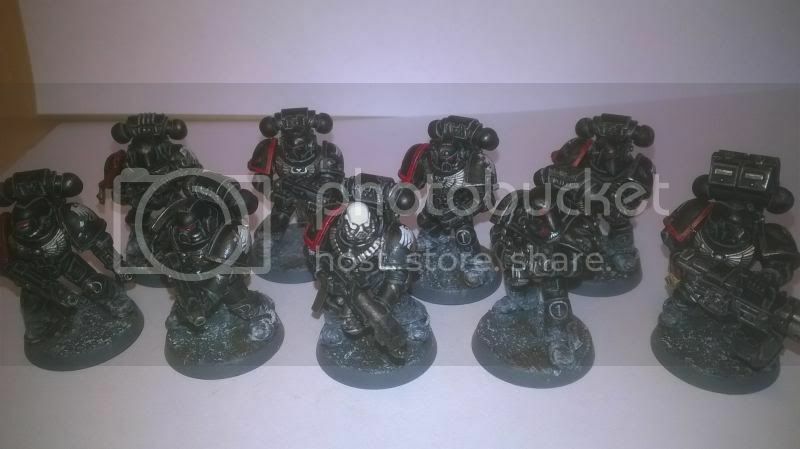 In the new codex there are various examples of Tactical Marines with red shoulder trim. 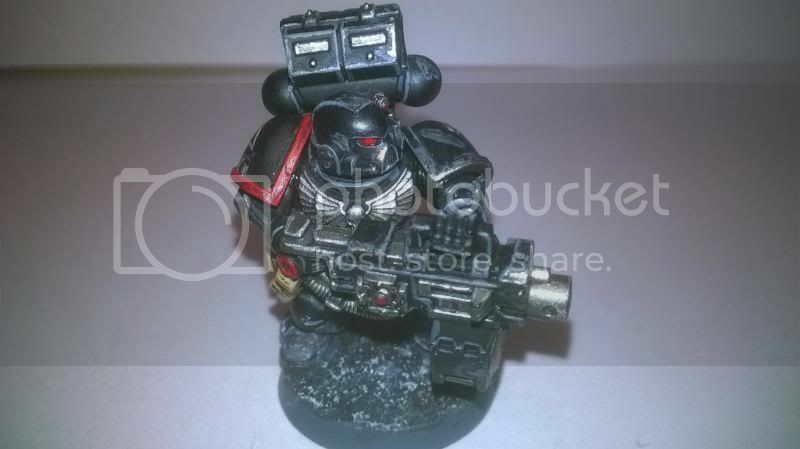 I take that to mean that Raven Guard now display company colour on the right shoulder. Waaaaaaaaaaaard! Erm.... I mean... Damnit Cruddace. 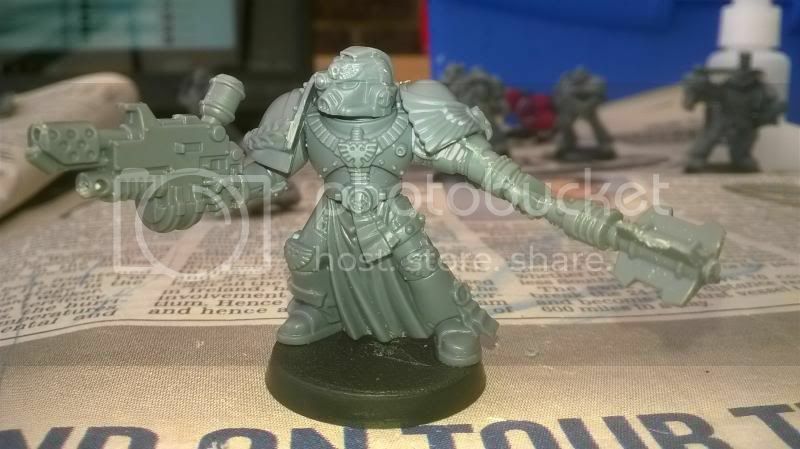 I see we're moving to having everyone being Ultramarines with different fetishes like Dreadnoughts or Beakies. It's been a year since the Orks came to the Forge World of Hephestia Alpha. The planet was strongly fortified with the greatest orbital and surface weaponry the Adeptus Mechanicus could provide including dozens of regiments of Skitarii troopers and several Titans of the Legio Crucius. But the Orks were a force of nature. Their fleet closed through the system like a battering ram until they reached their target and made planetfall with their Rok fortresses. They never attempted to remove the worlds defences in advance, but their numbers meant that even with the bloody toll taken from them, those that reached the surface were still more than enough for the task at hand. The first days of the ground war were a slaughter. In an attempt to claim the initiative the Skitarii Generals ordered an all out counter-assault on the Roks, expecting the find the Orks disorganised as they attempted to establish a foothold. Instead they found the Orks ready and pre-pared, backed by gargantuan Stompas and looted Guard Superheavy tanks. The Skitarii's assault broke against the unbridled fire power they faced and the Orks flooded from they holds, crashing upon the beleaguered soldiers like a green tsunami. The Imperial forces never truly recovered. Though the fighting was fierce for eight long months, true Imperial victories were sparse. Street by street, city by city and forge by forge the humans were pushed back. When the Skitarii won a battle the Orks would flee into the dense areas of woodland not yet claimed for resources, only to return days later in even greater numbers. Now the worlds defenders were scattered, reduced to isolated cells of resistance fighters, still fighting only out of sheer stubbornness. General Cyrax, now the de-facto leader of the planets remaining forces was as much machine as man. A once powerful young body was now carried by a pair of bionic legs. The right side of his face had been replaced by a dull chrome plate and the eye with a bulky cybernetic. His hands and forearms bore spider webs of silvery inlay, tiny augmentics that assisted him working consoles and displays for strategic planning and hid a plethora of digital weapons to boot. He stood now in a small clearing in the woods accompanied by a ten man team Skitarii troopers. They all wore the same drab green fatigues, the General long since doing away with the ornamented uniform he was paraded in. The only sign of his rank were the burnished golden pins at his collar. The sun was starting to set. The clearing was a makeshift LZ, only big enough for a single ship. Cyrax had expected a shipment of supplies from another cell but, like so many before it, the Valkyrie was late and the General feared the worst. He was about to give up when something caught his eye. Tiny shapes falling through the ever darkening sky. Black tear drop shaped things, as if the world itself was now mourning it's own demise. A dull monotone robotic voice spoke from behind him. Tech-priest Arka, a hunched little creature in hooded red robes, even less human than the General stepped up from behind him. “It seems the Emperor has answered your prayers.” he hissed through a large voice box where his mouth had once been. The Tech-priest turned away and the group started to make for the safety of the treeline. Cyrax softly breathed just one more word. So, time to start this log for real. 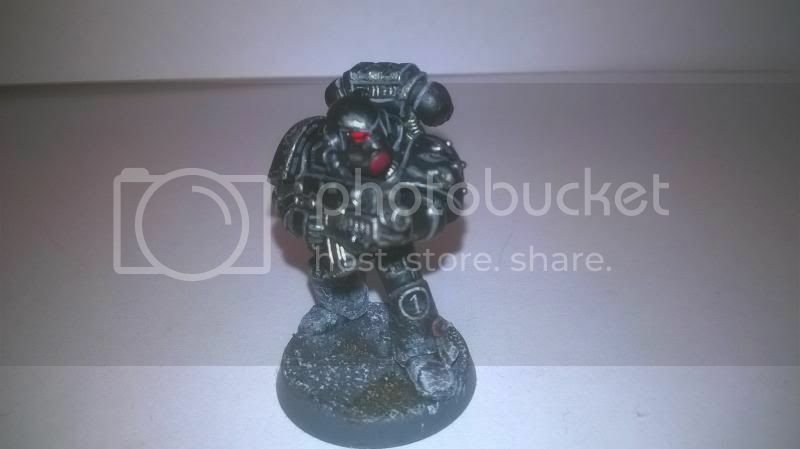 It will chronicle my work building a force from Kayvaan Shrike's famous 3rd Company of the Raven Guard. A little about me to begin with. 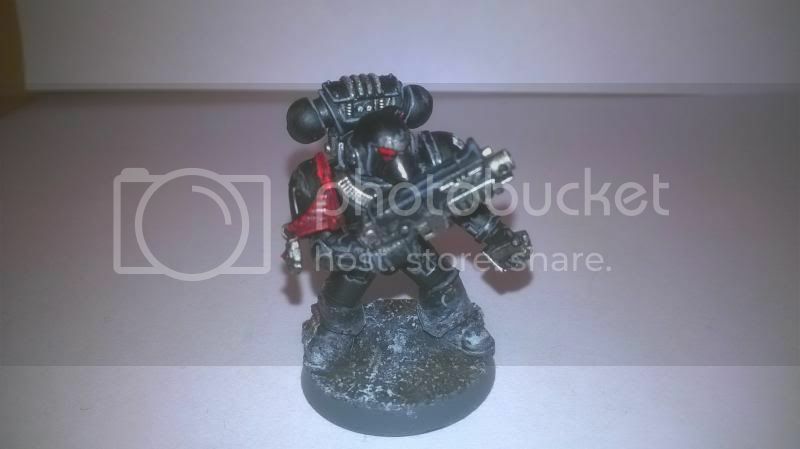 I first started playing Warhammer 40k when I was 12 with an army I quite laughingly referred to as the Iron Hands 2nd Founding Chapter, the Red Talons. I've always been a big Astartes fan. Since that first army I dabbled in Eldar, Daemonhunters, a DIY Marine Chapter I dubbed the Luna Hawks and a little fantasy with High Elves. I'm now 26 and I've been meaning to start a new army since the release of the 5th Edition codex. I don't know if anyone else has ever had the same issue but I personally found choosing a Chapter to be one of the toughest decisions ever. I was determined to do something unusual, a Chapter people won't have seen often but without doing another DIY. 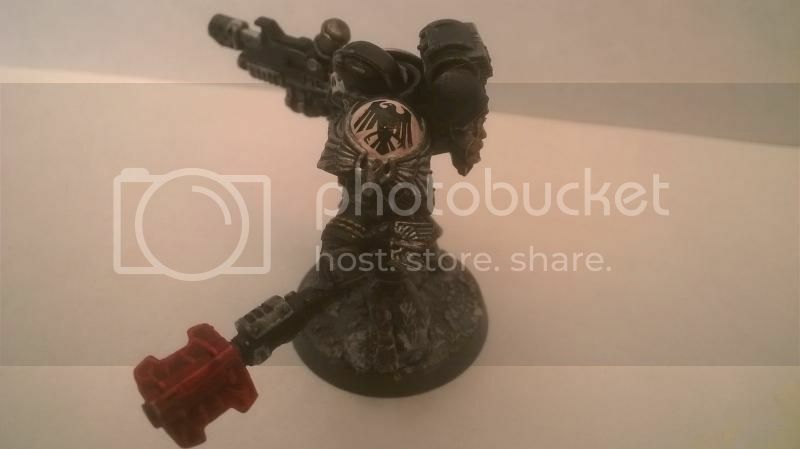 My breakthrough came when I decided to stuff being original and just do an army that inspired me, which is how I came to the Raven Guard 3rd. This isn't going to be a fast moving log because I'm working on a budget but I'll be doing as much as I can. I finally got some models finished and I'm not ashamed to say they're the best I've ever done. I'm disappointed in the pictures. 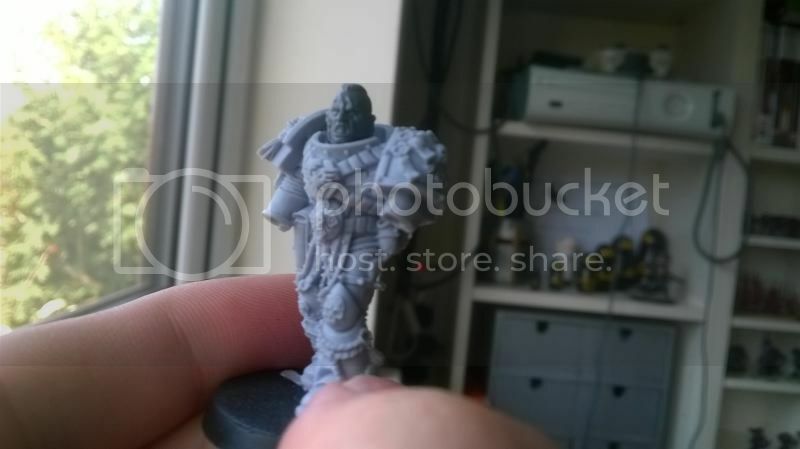 I feel they make the models look much more blotchy then they do in my hand but hey, what can you do? Of course there's always room for improvement so C+C is welcome. Without further ado, the first four members of Tactical Squad Corvinax. Edited by Asamodai, 28 March 2014 - 06:48 PM. Think they're shaping up nicely! Cool. 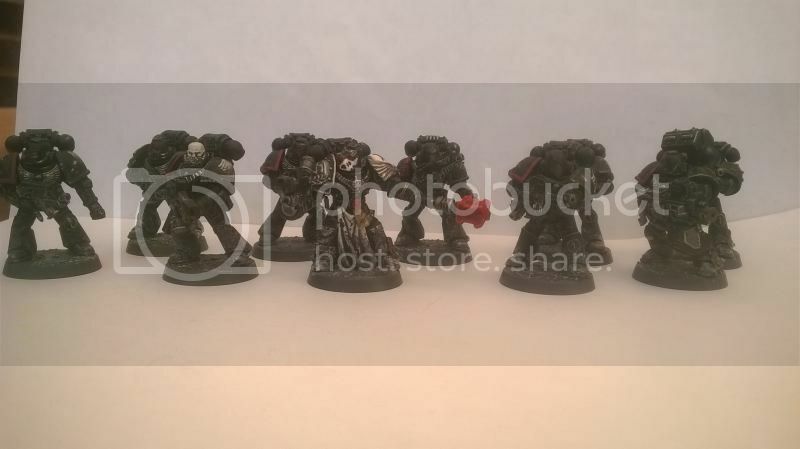 Are you looking forward to the third Horus Heresy book and the Raven Guard legion models? "Remember that howsoever you are played or by whom, your soul is in your keeping alone, even though those who presume to play you be kings or men of power. When you stand before God, you cannot say, "But I was told by others to do thus," or that virtue was not convenient at the time. This will not suffice. Remember that" (Kingdom of Heaven-2005). Yeah definately. Don't know if I'll be able to buy the book because that's money that can be spent on more models but I'm really looking forward to seeing what stuff comes out for them. Not sure what I'd do though. 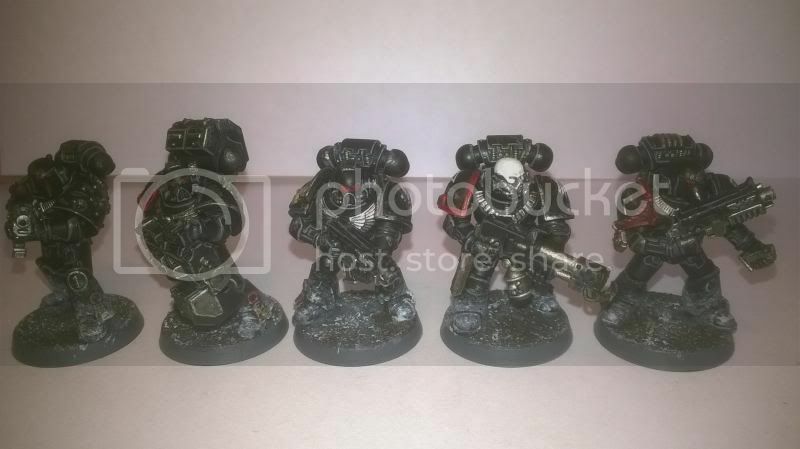 Find ways to add them to my 40k or start a seperate 30k Raven Guard army too? Looking great, man. Nice weathering. Any plans to buy the FW decals? I have. The Chapter badges, tactical markings and squad numbers are all off that sheet. 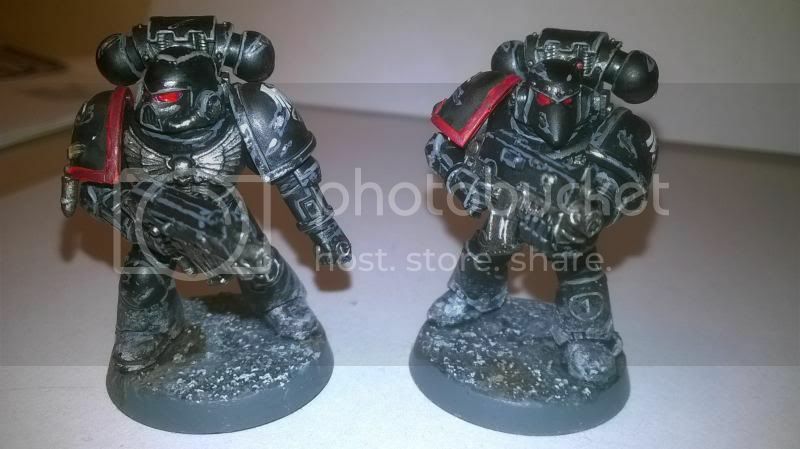 I love the way you did the black on these guys, somehow it makes you them seem more menacing. Quick update time. I got a box of Sternguard Veterans yesterday that I've been having fun with. 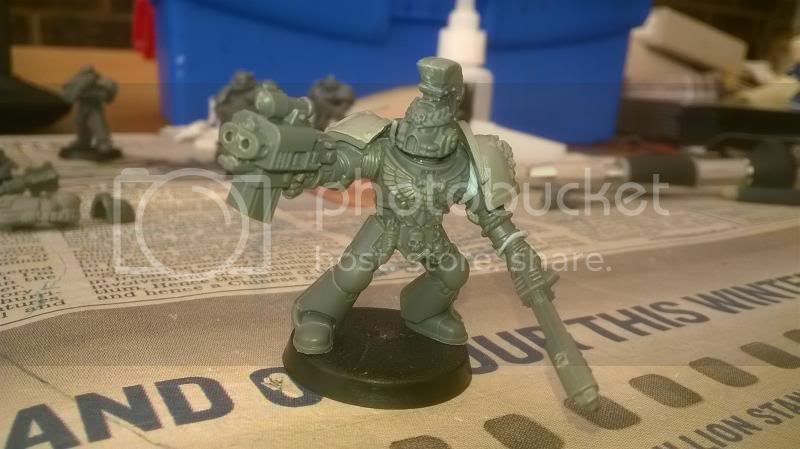 I've made a Veteran Sergeant, adding a heavy bolter and put some fancy shoulder pads on a couple of tactical marines. I'm looking for some opinions on some weapon options though. 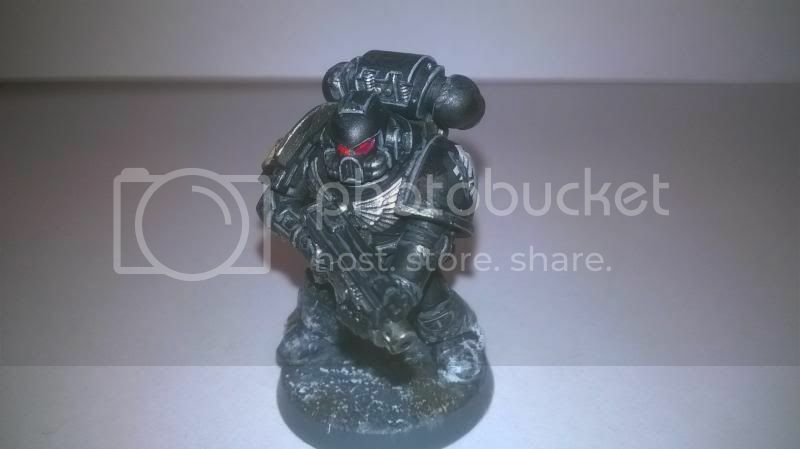 First is Veteran Sergeant Corvinax. Do I go with the classic lightning claw? 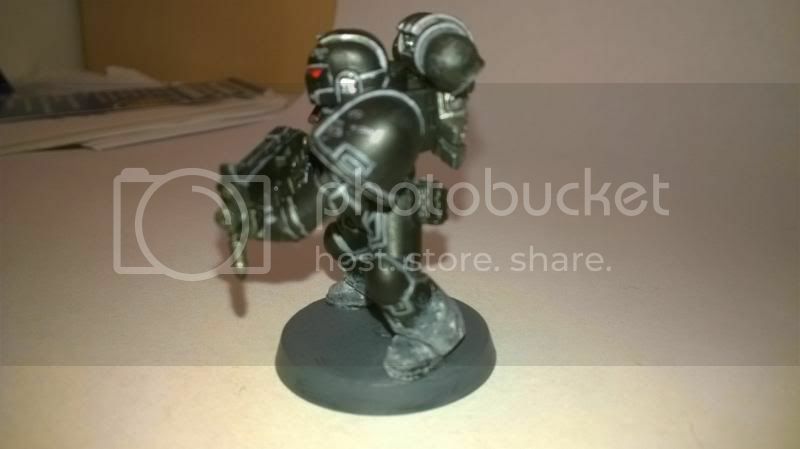 Or break away from the typical Raven Guard and go with a power maul? 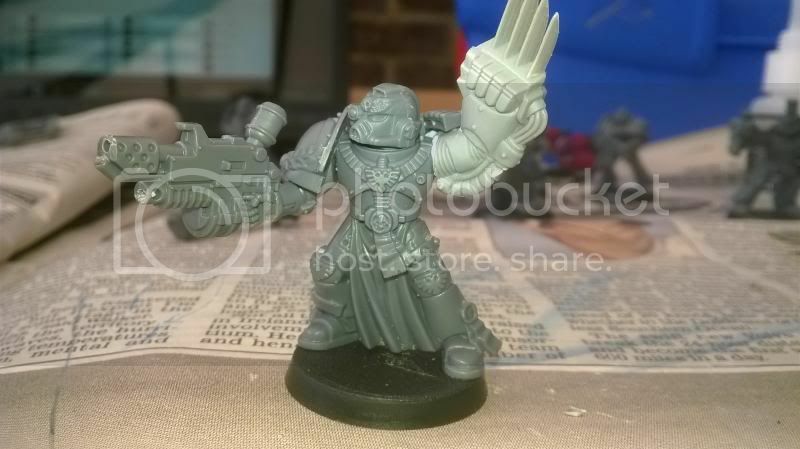 Then secondly we have my, as yet unnamed Ultramarine Deathwatch Sergeant. I'm torn between the cool sheather power sword. I vote for the power maul. Glory to Corax and the xix. I also vote maul - pose looks better in my opinion, more threatening and natural than waving your arm in the air when shooting! 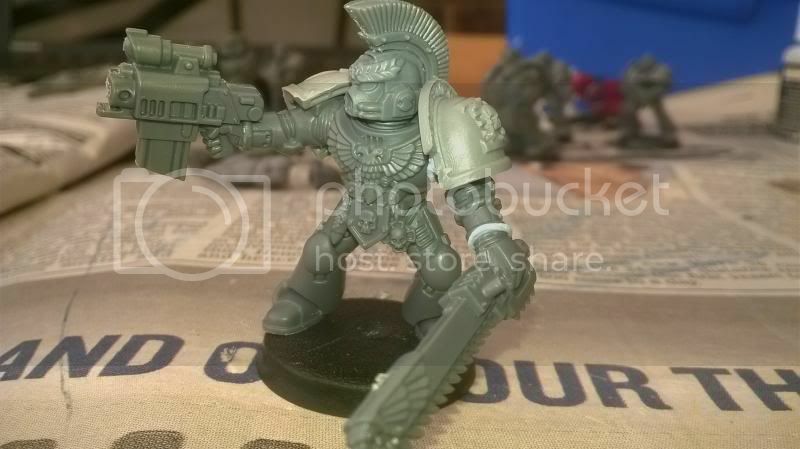 Plus, not ALL ravens go for claws As for the ultramarine, I'm not sure - I'm a fan of sword and chainsword... where is his helmet crest from, its ace! I went for the maul and the chainsword. 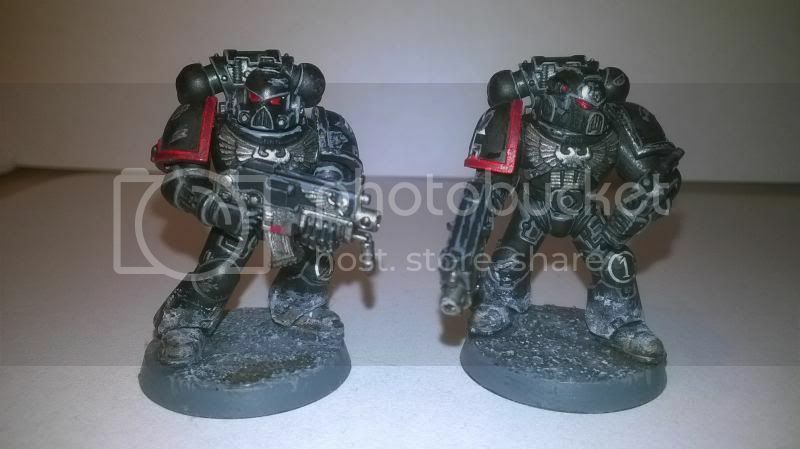 The two sergeants have been undercoated but are waiting to be painted until the rest of the tactical marines are done. Progress has been fairly slow on them but it's probably only a few hours more painting time to get the next five guys done. It does however bring me to a little problem. 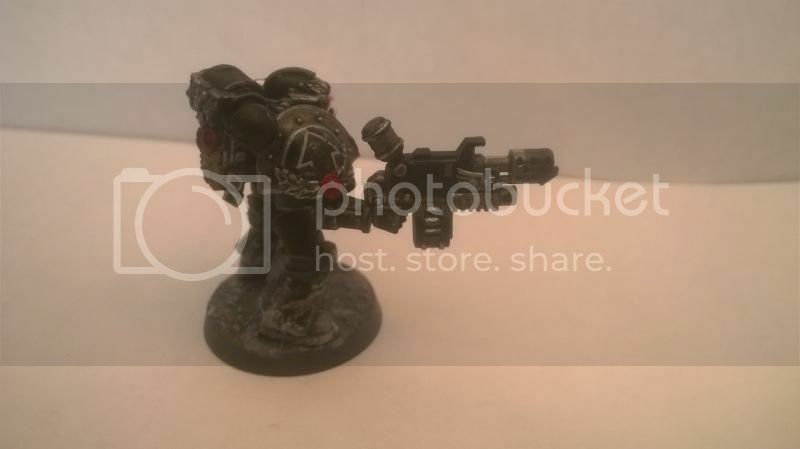 This is the Sternguard Heavy Bolter with the arms it said to use, on a normal tactical marine body. As you can see, the arms are wider than the body. I'm guessing the answer is going to have to be green stuff but I'm wondering, as my green stuff skills are non-existent, if anyone has a simpler solution. 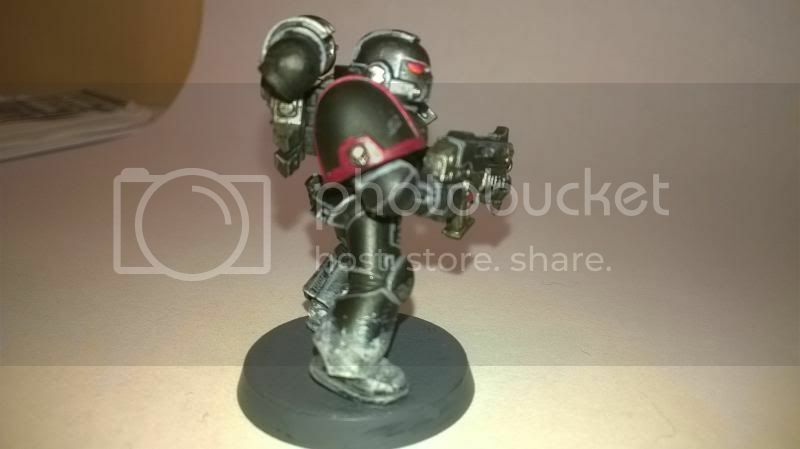 I have 2 Marines with the Sternguard HB and had no issues with it fitting. Hey, sorry I missed this on the last post. 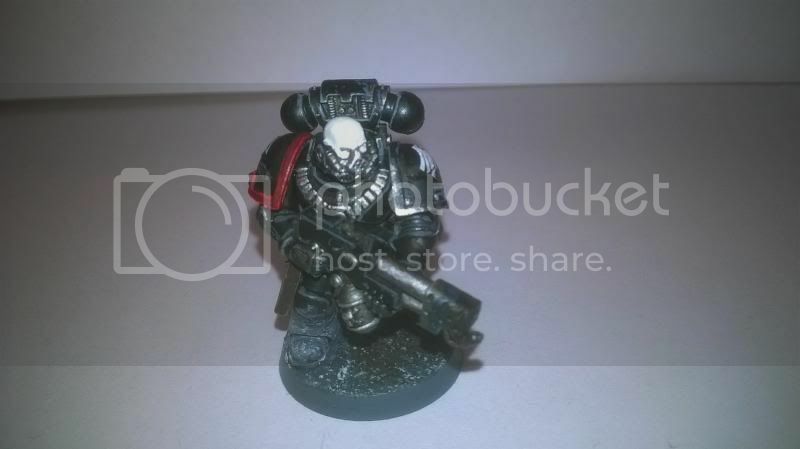 The helmet crest is from the Sternguard box. I wish it was as simple as that but even if I just hold it there there's still a very noticable gap. Needed the blu-tac though so I'd have my hands free to take the picture. Thanks for the suggestion. Sounds pretty good. 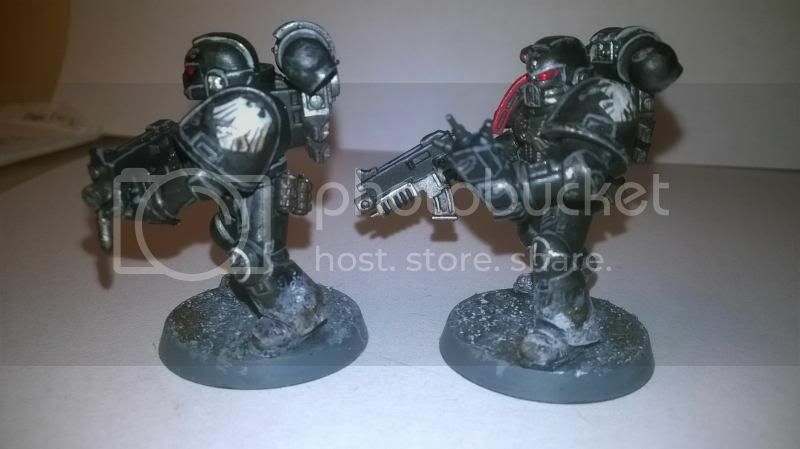 Ok so here's a couple of questions for Raven Guard aficionados. 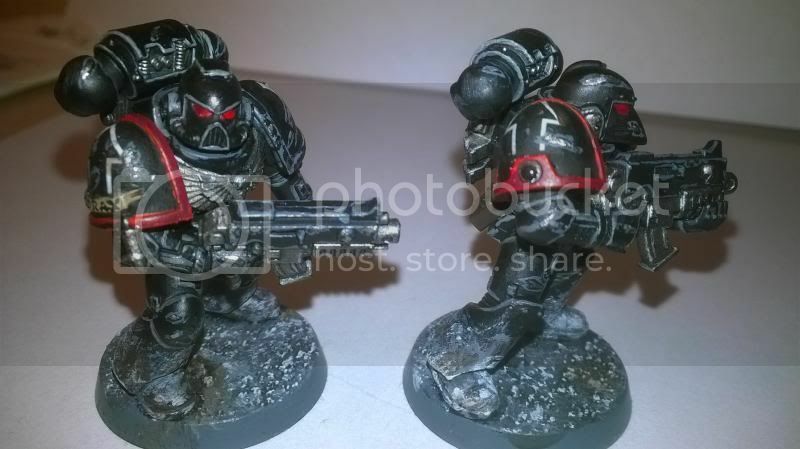 1) How do you do Sergeant and Veteran Sergeant markings? 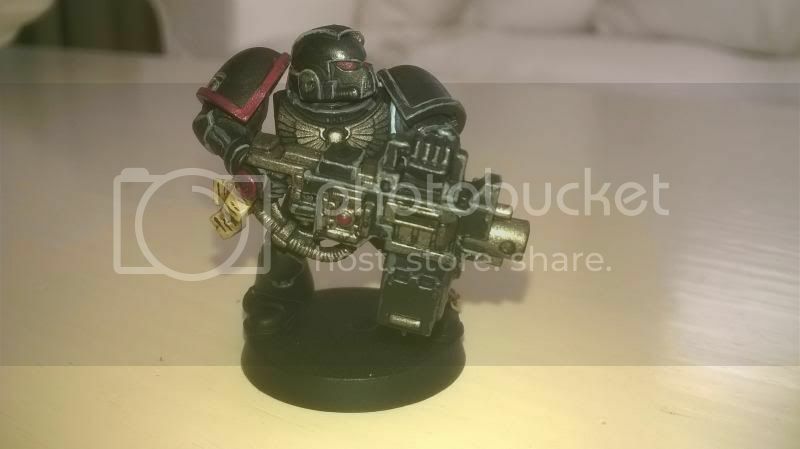 It's clear Raven Guard don't use the typical red helmet and, if necessary, white stripe system. I've seen some examples where the sergeant has a white helmet but the codex also shows non-sergeants, like the 3rd Company Standard bearer with a white helmet. Then how would you do denote veteran status on top of this? I know first company veterans have white arms but would you employ this much to veterans serving in other companies? There's a image I believe had been taken from the new HH book that shows veteran sergeants with white faces and other veterans with a white tripe but is it likely they'd have stuck to this scheme since then? 2) A couple of members of my tactical squad I'm currently painting don't have trim on their left shoulder I am currently using to denote company. What do you believe would be the best way to otherwise represent this? 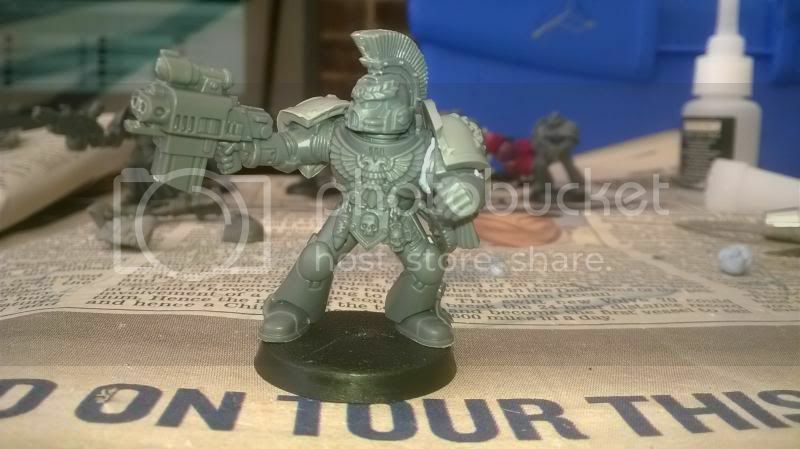 3) One marine has full mark 6 armour, including the studded left shoulder. This means his Chapter badge has moved to his right shoulder but where would you then put the squad markings? I have some ideas for each of these but I'm interested in any extra input anyone can provide. Update time. I actually got some models finished. 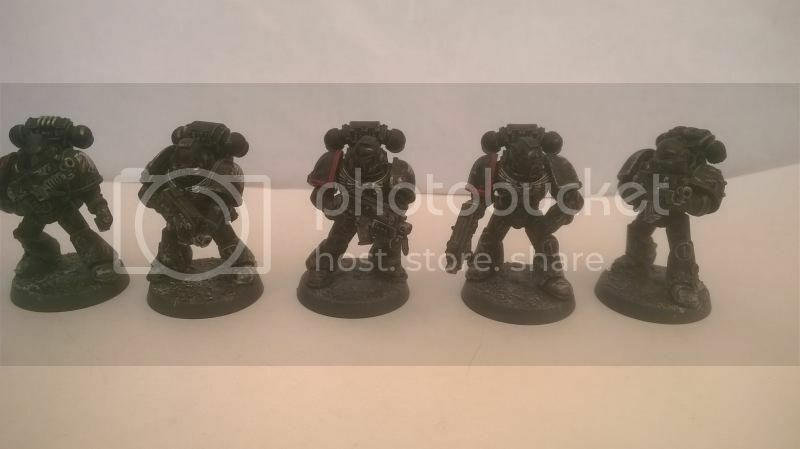 Five more tactical marines done meaning my first squad are just missing their Sergeant who I will be working on next. Still using the same phone camera for this so apologies again for poor picture quality. Thoughts on skin work will be greatly appreciated. And the whole squad so far. The drop pods hammered into the ground in quick succession, four of them, landing in a near perfect diamond a short way out of Forge-Hive Arodite, the second largest on the planet. A heartbeat later and explosive bolts blew open the trios of doors on each pod, opening them up like blooming metal flowers. Now exposed, benevolent machine spirits scanned the surrounding rubble, mounted storm bolters casting back and forth purposefully. Another second and the Raven Guard deployed. 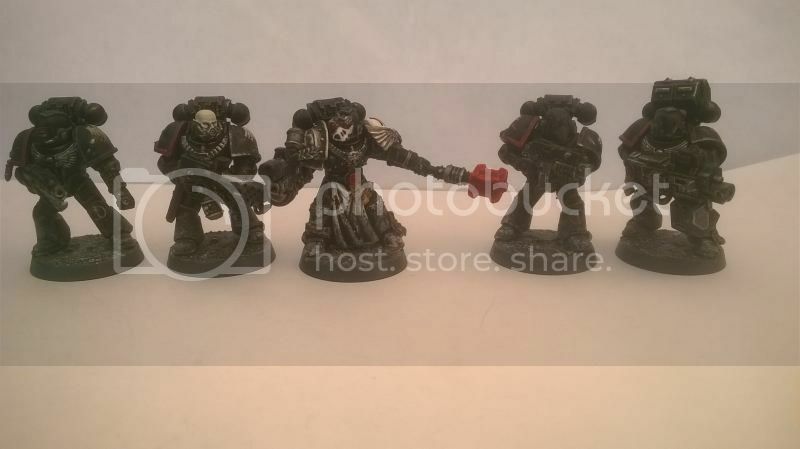 Thirty Astartes in total, forming four units. At their head was Sergeant Corvinax. 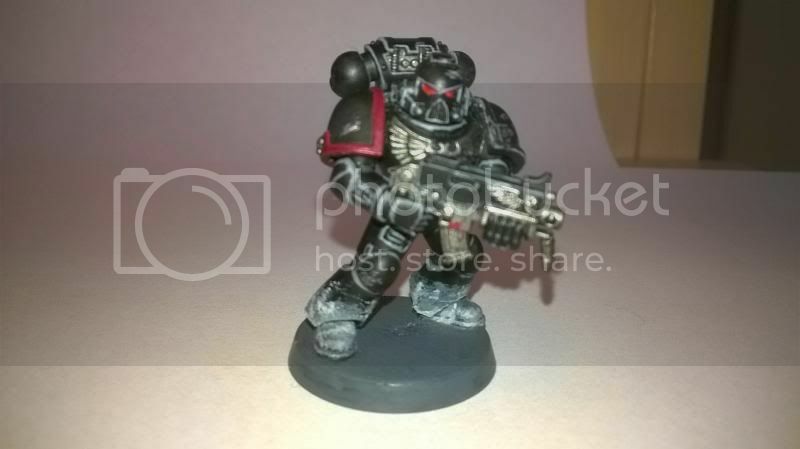 Leader of the 3rd Company, 1st Squad, first among equals and de facto sub-commander of the Company's Tactical Squads, Sergeant Corvinax was a veteran of the Chapter having served with the 3rd since long before the events of Targus VIII. A valued officer of the illustrious Shadow Captain, Corvinax and his squad were often found at the vanguard of the Raven Guard assault. He led the disembarkation, his ancient suit of Maximus power armour seeming to absorb the waning sunlight, his combi-flamer raised, alert for the Greenskin threat. 1st Squad fanned out around him with practised perfect precision, their weapons raised, covering all angles of approach. Corvinax lowered his weapon, “Brother Zeron. Report.” he ordered over the squads internal comm link. “At ease Brothers.” said Corvinax, and the detachment lowered their weapons. The Sergeant unsealed his helm and removed it, tucking it under his left arm. 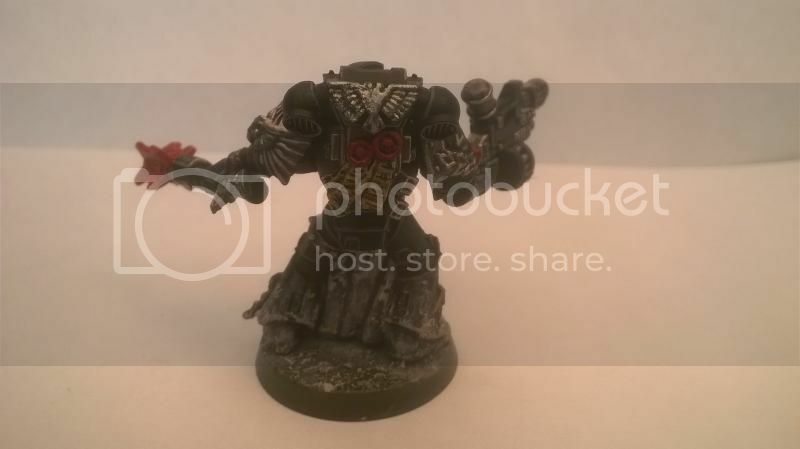 Beneath it he was the very image of a Raven Guard. His skin pale as snow and his long hair, oiled against his scalp was black as pitch. “You can come out now.” he said. From amongst the rocky outcrops and chunks of blasted masonry, five more figures appeared. They were young, only children by typical human standards. But these were no normal adolescents, these were novitaes of the Raven Guard. They slung back their camo cloaks and approached the new arrivals, their long barrelled sniper rifles held with an easy alertness already born of years of experience. Scout Squad Kraine had been on Hephestia Alpha for two days already, preparing for Corvinax and his detachment's arrival. The Sergeant, still only a novice himself snapped off a salute, beating his fist against his chest. “Scout Squad Kraine reporting Sir!” he said confidently, pushing out his chest and standing rigidly to attention. Hey, so, long time no update. I'll admit I lost motivation for a little while there and when I did get started this last model was kinda tricky. I've got him done though and with him my first complete squad. So I give you Sergeant Corvinax. I'm not 100% happy with him. The white was tricky, especially the loin cloth. Maybe that's just a case of practise though. While I was taking pictures I tried getting a couple more of the rest of the squad with some more natural light to see if that improved anything. As always all C+C is welcome. Next up, Sergeant Icarus. Just a quick look at one of my next models. I managed to pick this guy up cheap at an event at my local library of all places. I love the model but I can rarely leave anything be so I wanted to make some changes without upsetting the general mood of the model. 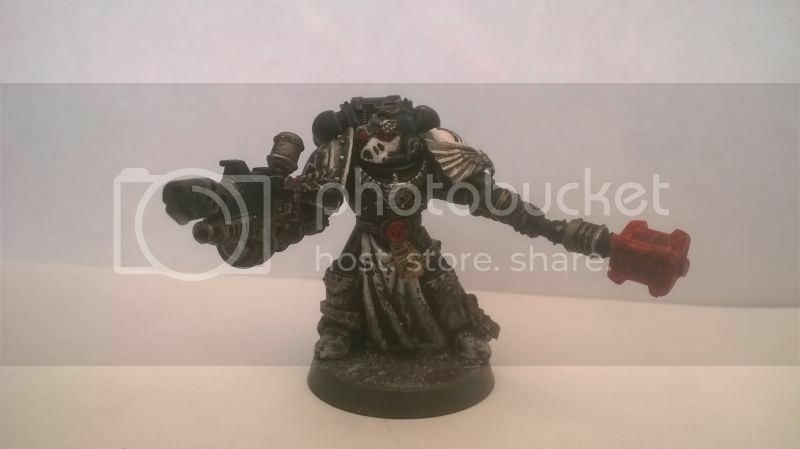 So far I've swapped the head with one out of the Sternguard box. I'm looking for suggestions on weapons though. I'm not a fan of the axe he comes with. He's going to be used as a second Captain accompanying a standard Assault Squad but that's not overly important as I probably won't be playing any games. I'm mostly looking for a weapon(s) that convey the same cold menace as the axe.